Includes a 12" 24 pages stapled booklet. Credited notes, credits and the lieder text/lyrics in English, German & French. Printed in Germany by Gebrüder Jänecke, Hannover. Rim text at 9 o'clock: "Urheber · Und Leist..... ........". No star printed on bottom. "4 LP - Stereo 2720 059" on spine. - Franz Schubert: Lieder Volume I. 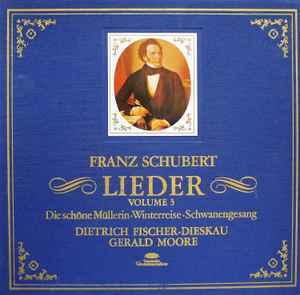 The Lieder composed from 1817 to 1828 on 12 records (text also in German and Fench). 220 006. Other (Rights information: Public domain declaration): D.P.